This gazebo can be placed just about anywhere–down by the lake, on a patio, off the deck or just in the middle of the yard. This is our best seller because of all the options. It can come with screens and screen door or a 4-track vinyl window kit. The windows add the element of privacy and allows for a longer season. The gazebo is available in 40-year tested pressure treated double kiln dried southern yellow pine, cedar or maintenance free white or cream vinyl. The #1 Octagon gazebo is available in: 8 ‘x 8’, 10 ‘x 10′, 12′ x 12’, 14 ‘x 14’, 16 ‘x 16′, 18′ x 18’ and 20 ‘x 20’. All our gazebos are Amish made. The floors in our gazebos are screened to keep the bugs out. Available in pre-built kits. Some sizes can be delivered assembled, or we have a crew that will assemble for you. 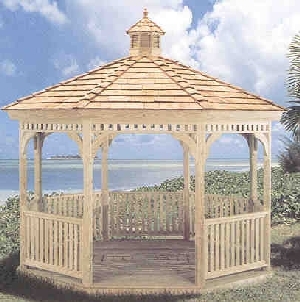 Wood gazebos are made from double Kiln dried pressure treated southern yellow pine. After going though the processing it will make the southern yellow pine into a hardwood, in-turn increasing the snow and wind load ratings. A very low maintenance product but long lasting, roughly 30-40 years of use. Choose the gazebo to be open, screens or a 4-track low maintenance window system with screens. All gazebos can come with a screened floor, cedar or asphalt shingles. The Anoka/Ramsey Minnesota location has them on display. Enjoy the summer, bug free.